Chestnuts Welcome At Any Winter Table Once a staple of early American meals, chestnuts now turn up mostly around the holidays. But the meaty little morsels are suitable for far more than roasting on an open fire. Get recipes for Roasted Chestnut Soup With Pear, Parmesan And Celery, Slow Cooker Lamb With Chestnuts, Maple-Chestnut Ice Cream and Chewy Chestnut Cookies. I almost poisoned myself this fall, sampling some foraged Ohio buckeyes. Someone told me they were chestnuts. They looked and felt just like chestnuts, with their brown, lacquered shells. But they didn't taste like chestnuts. Luckily, those conkers (also known as horse chestnuts) I roasted were repellently bitter. Carry a buckeye, as my great-grandfather did, in your pocket for good luck. For eating, though, they are not. I confused them with their sweet edible cousins and the cozy image in Nat King Cole's Christmas song of "chestnuts roasting on an open fire." 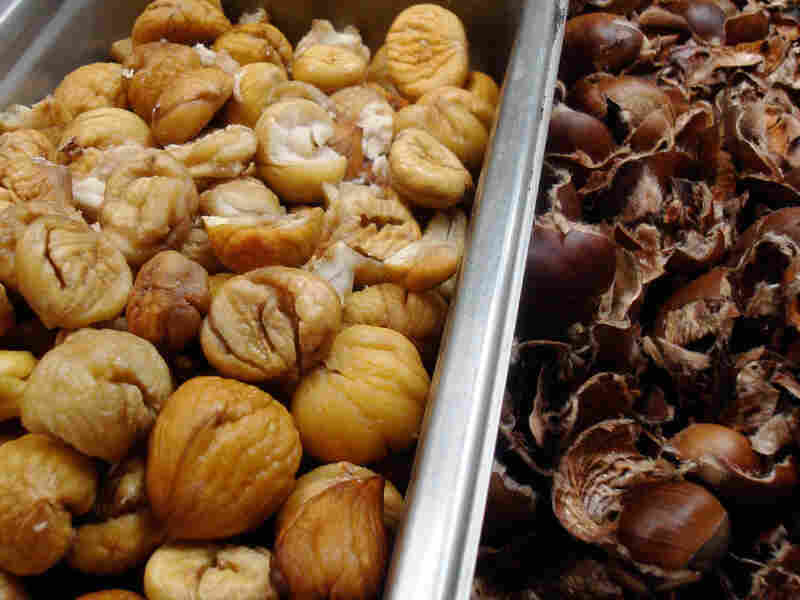 However, many of us have never seen fresh chestnuts, much less roasted or even eaten them. Once a staple of American life, towering chestnut canopies filled American forests. Durable "cradle to coffin" chestnut timber built our communities, and our cuisine (particularly that of the Cherokee Indians, who revered this "bread tree") relied on the starchy nutmeat. But by the mid-20th century, a fungal blight from Asia obliterated 4 billion of the indigenous East Coast trees. The American chestnut practically disappeared overnight. Peeling [cooked chestnuts] is somewhat painstaking work. Do it with company, and pop some hot ones in your mouth as you go. There's something visceral and almost meditative about such repetitive kitchen tasks. Roasting and peeling chestnuts is a welcome respite from the holiday frenzy. Most fresh chestnuts now come from Italy, China or Korea. Seeing vendors roasting those imported chestnuts on the streets of New York City is a comforting sign of winter's arrival. Here in the Northwest, organic, local chestnuts are for sale at farmers markets and food co-ops through December. But almost nowhere can you buy that smaller, sweeter, more nutrient-dense native variety. The country's rare chestnut orchards mostly grow bigger, easier-to-peel Dunstan and Colossal varieties. Still, ecologists and growers are busy replanting new blight-resistant American hybrids on farms and in Appalachian forests. Part of America's culinary heritage died with those fallen trees. Thanksgiving is about the only time Americans cook with chestnuts, in stuffing for the turkey or with Brussels sprouts. There are, however, more unusual preparations that could be part of any winter holiday feast or weeknight meal. 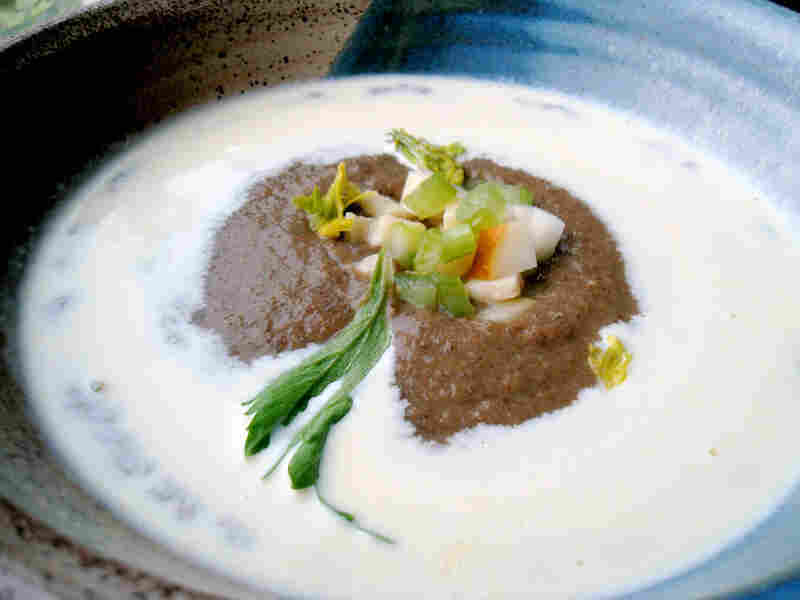 Try a chestnut soup, its earthy porcini puree encircled by Parmesan cream and topped with crisp celery and pear. Chestnuts also blend into velvety winter squash, pumpkin and root vegetable purees. Or saute them with peppery pancetta and sage served atop tagliatelle or tucked into ravioli. Even make your own noodles or spatzle with them. For Hanukkah, which goes through Saturday, I made my husband chestnut flour latkes with pine nuts and dried cranberries. They couldn't compete with the traditional potato ones, but we loved Claudia Roden's Sephardic lamb with chestnuts, a fragrant yet simple stew. My husband savored its broth-soaked morsels, after first dismissing chestnuts for tasting like "dry plantains." Laura McCandlish is an Oregon-based freelance writer. She contributes to The Oregonian's FOODday section and hosts a monthly food show on Portland radio station KBOO. She blogs at baltimoregon.com. For Chinese New Year, chestnuts are an auspicious food. Stuff chestnuts and dates into sweet dumplings, stir-fry them with ginger and chicken or duck or boil them into the Korean chestnut rice called bam baap. Somehow old-fashioned chestnut desserts such as meringue-topped Mont Blancs and Nesselrode pudding weren't on my radar. (Find a recipe for Nesselrode pudding on this page.) 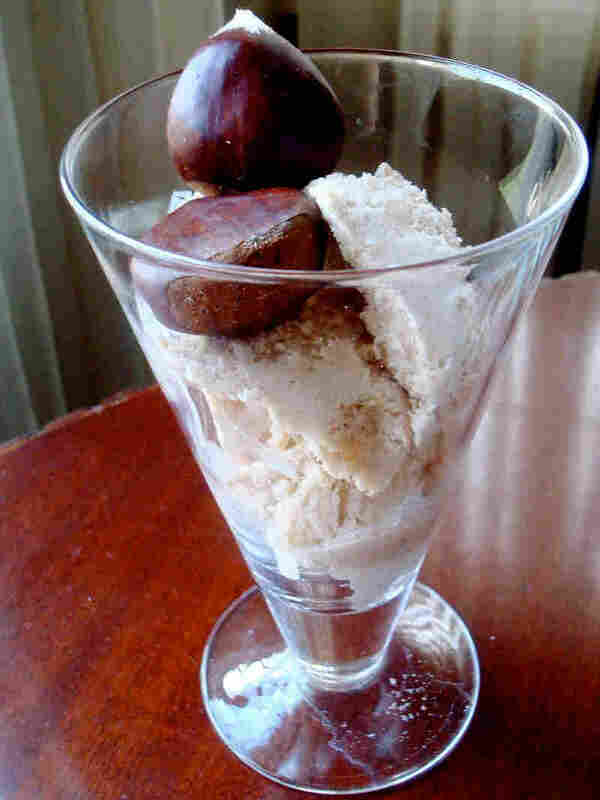 However, chestnuts can subtly star in any confection: creamed for crepe fillings, folded into gelatos, candied or in syrup, blended into chocolate tortes and cakes. I made a maple-chestnut ice cream, and with the leftover egg whites, whipped up some chewy flourless (and gluten-free) chestnut cookies. You'll appreciate such light treats after a button-bursting meal. High in complex carbohydrates but, unlike other nuts, low in fat, chestnuts, from a cooking standpoint, behave more like grains or starchy vegetables. They're also quite perishable (check to make sure the raw ones aren't dried out or moldy). 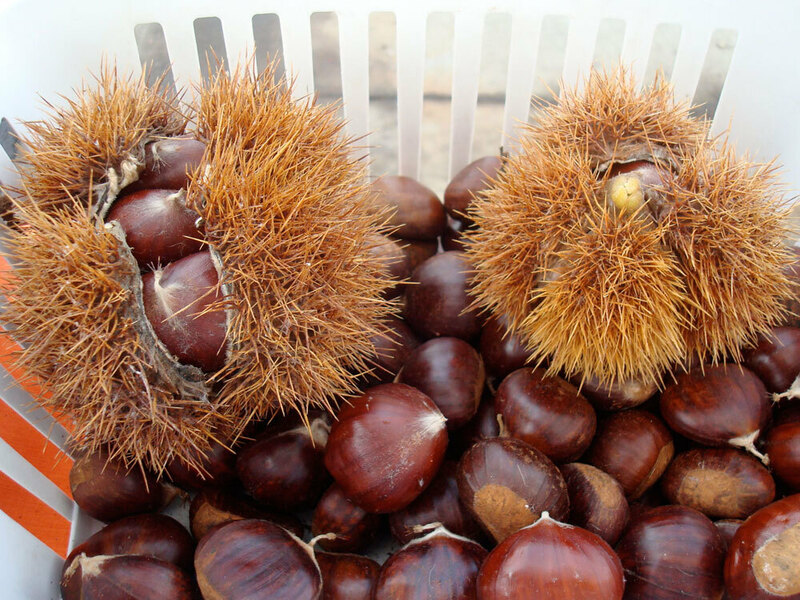 If you can't find fresh chestnuts, many orchards sell them online. Consult the Chestnut Growers of America map for one in your area. Chestnuts should be cured on the countertop for a few days, until they lose their sheen, becoming sweeter and easier to peel. Otherwise, store them in the refrigerator for about a month. You can boil chestnuts or buy peeled ones frozen, vacuum-packed or canned at many high-end and ethnic groceries. But the Christmas song is right: Nothing compares to the aroma and the caramelized flavor of chestnuts roasted over an open fire. I experienced that magic recently, when my chef friend let me roast some in her restaurant's wood-fired earth oven. Cook up several pounds' worth, shell them and freeze what you don't use for later recipes. Peeling off each cooked nut's hard shell and thin, bitter inner skin is somewhat painstaking work. Do it with company, and pop some hot ones in your mouth as you go. There's something visceral and almost meditative about such repetitive kitchen tasks. Roasting and peeling chestnuts is a welcome respite from the holiday frenzy. Just stay away from the buckeyes. It's essential to pierce the shells before roasting — otherwise the chestnuts will explode in the oven. Blackening the nuts over a fire creates a nice smokiness. Covering the hot, unpeeled nuts with towels to steam for a bit makes them easier to peel. With a serrated paring knife, score an "X" into the flat surface of the shell (try to avoid the nutmeat). Place in a shallow pan. Sprinkle liberally with water. Roast at 400 degrees for about 20 minutes, until you can remove the shells easily. If nuts become difficult to peel, reheat or cut in half and scoop out flesh with a spoon. Once shelled, chestnuts don't store well. Freeze what you don't intend to cook right away. Chestnuts also can be roasted on the top of a wood stove, directly on a grill or, of course, over an open fire. For mashes and purees, bring the nuts to a boil in lightly salted water. Turn off the heat after 3 or 4 minutes. Remove a few nuts at a time for peeling. You can even microwave the nuts. Score 12 chestnuts with that "X," arrange them on the outer section of a paper plate and then microwave for 2 minutes. The Thanksgiving meal at Rialto Restaurant in Cambridge, Mass., commenced with this elegant soup. It's more flavorful and complex than a pure chestnut one. Chef Jody Adams, who first discovered marrons glaces (crystallized chestnuts) as a teenager in France, regularly features them on her regional Italian menu. This is an easily adapted recipe. Just leave out the cream for lactose-intolerant or calorie-counting guests, Adams says. In a large soup pot, render the pancetta with 2 tablespoons olive oil over medium heat. Add the carrots, turnips, onions and celery, season with salt and pepper and cook 8 minutes or until tender and slightly caramelized. Add the mushrooms and cook 15 minutes until tender and dry. Add the Marsala and deglaze the pan. Add the chicken stock and bouquet garni and simmer 30 minutes. Remove the pancetta and bouquet garni and puree until smooth. Meanwhile, heat 2 tablespoons olive oil in a saute pan. Add the chestnuts, season with salt and pepper, and cook 10 minutes or until golden brown. Add the shallot and cook 5 minutes. Add the white wine, bay leaves and thyme and reduce halfway. Add water to just cover the chestnuts. Cover with a round of parchment paper and cook 12 minutes or until tender. Remove herbs and puree until smooth. Mix the two purees together. Taste and adjust seasoning. To make the Parmesan cream, heat the cream in a small saucepan over medium heat. As soon as the cream is warm, whisk in the Parmesan cheese until it has completely melted. Season with salt and pepper and keep warm. To serve, put a quarter-cup Parmesan cream in the bottom of a warm soup bowl. Carefully pour the mushroom chestnut soup in the center of the cream. The cream should move up the side of the bowl, forming a white rim around the dark soup. Mix the diced pear, cheese and celery together. Top the soup with the diced mixture. Garnish with celery leaves. *A bouquet garni is a combination of herbs bundled in cheesecloth or tied with a string and used to flavor soup, stocks and sauces. I bunched together fresh thyme, sage, dried bay leaves and rosemary. You can also add dried or fresh marjoram, celery leaves or leek to your bundle. 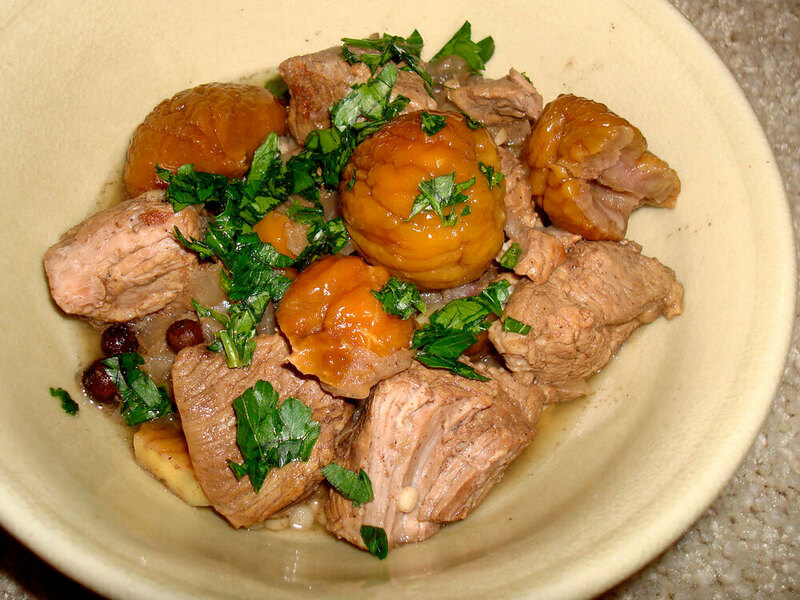 Claudia Roden includes this Judeo-Spanish stew from Turkey in The Book of Jewish Food (Alfred A. Knopf 1996), almost identical to a Tunisian lamb tagine featured in The New Book of Middle Eastern Food (Random House 2000), which she originally published in 1968. Sometimes too dry, roasted chestnuts grow moist bathing in this stew's fragrant broth. For a fruitier stew, substitute red wine for the water and add orange zest. Instead of simmering it on the stovetop, after browning the lamb, I braised it in my slow cooker for 6 hours on low. Top it with lemon juice and chopped parsley, to balance the lamb's richness. I served the fork-tender meat over Israeli pearl couscous. Saute the onion in the oil on very low heat, stirring occasionally, until golden. Add the meat and turn to brown it all over. Add salt and pepper, cinnamon and allspice, cover with water and bring to a boil. Remove scum and simmer 1 1/2 to 2 hours, until the meat is very tender. Meanwhile, to peel the chestnuts, make a slit on one side with a sharp-pointed knife and grill under the broiler, turning them over once, until they are only slightly colored and the skins can come off easily. Peel them while still hot. Fifteen minutes before the end of cooking the lamb, add the chestnuts. If you like, add the lemon juice and serve sprinkled with parsley. Maple and cardamom beautifully accentuate chestnuts' subtle, buttery flavor. This ice cream pairs well with holiday pies, chocolate cakes and cookies. I adapted this recipe from one that originally appeared in now-defunct Gourmet Magazine in 2000. Finely chop chestnuts and cook with 1 1/4 cups milk at a bare simmer in a large heavy saucepan, uncovered, stirring occasionally, 15 minutes. Puree in a blender until smooth (be careful when blending hot liquids). Bring cream and remaining 1 3/4 cups milk just to a simmer in heavy saucepan and remove from heat. Beat together yolks and maple syrup in a large bowl with an electric mixer at high speed until thick and pale and mixture forms a ribbon when beaters are lifted. Whisk 1/3 of hot cream mixture into yolk mixture to temper, then whisk yolk mixture into remaining cream mixture. Whisk in chestnut puree and salt. Cook over moderately low heat, stirring constantly, just until mixture registers 170 degrees on an instant-read thermometer (do not boil). Immediately pour custard through a fine sieve (not necessary if it seems smooth enough) into a clean metal bowl and stir in vanilla and, if desired, cardamom. Set bowl in a larger bowl of ice and cold water and cool custard, stirring occasionally. Chill, surface covered with waxed paper, until cold, at least 3 hours. Custard can be chilled up to 24 hours before freezing. Freeze custard in an ice cream maker, then transfer to an airtight container and put in freezer to harden. Mark Bittman recommends this variation on his chewy almond-cherry cookie recipe in How to Cook Everything Vegetarian (Wiley 2007). I spiced them up with ground nutmeg and cardamom. Crystallized ginger, cinnamon, citrus zest or fennel/anise are other flavors that would add to this recipe. Put the chestnuts and granulated sugar in a food processor and pulse until combined. Put the egg whites in a large bowl and beat until foamy with an electric mixer. Add the vanilla and beat a bit more. Gradually add the chestnut mixture, stirring until a loose, sticky dough forms. Cover and chill in the refrigerator at least 2 hours or overnight. Cool the cookies completely on the sheets, then remove with a spatula. 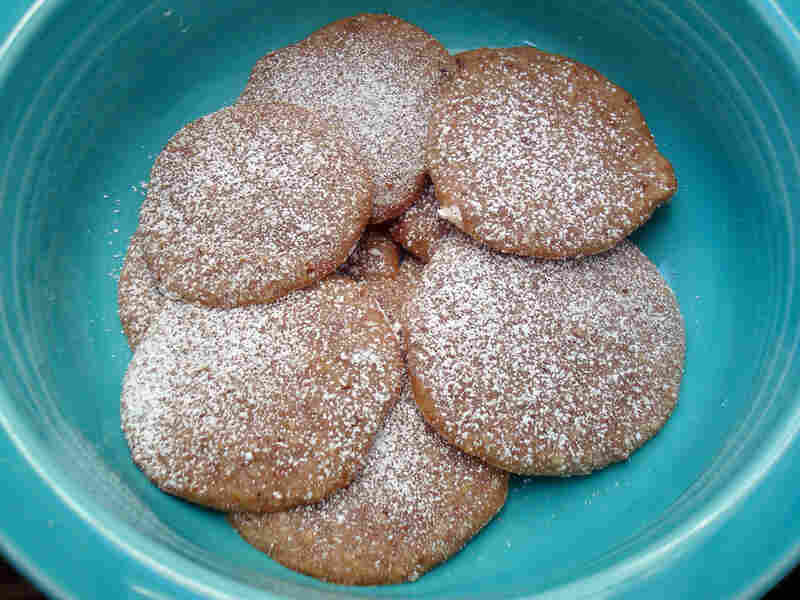 Dust with confectioners' sugar before serving if you like. These keep well in an airtight container for up to 3 days.